A new data viewer with support for large datasets, filtering, searching, and sorting. The source editor now provides code diagnostics (errors, warnings, etc.) as you work. User customizable code snippets for automating common editing tasks. Tools for Rcpp: completion, diagnostics, code navigation, find usages, and automatic indentation. Many additional source editor improvements including multiple cursors, tab re-ordering, and several new themes. An enhanced Vim mode with visual block selection, macros, marks, and subset of : commands. There are also lots of smaller improvements and bug fixes across the product. Check out the v0.99 release notes for details on all of the changes. 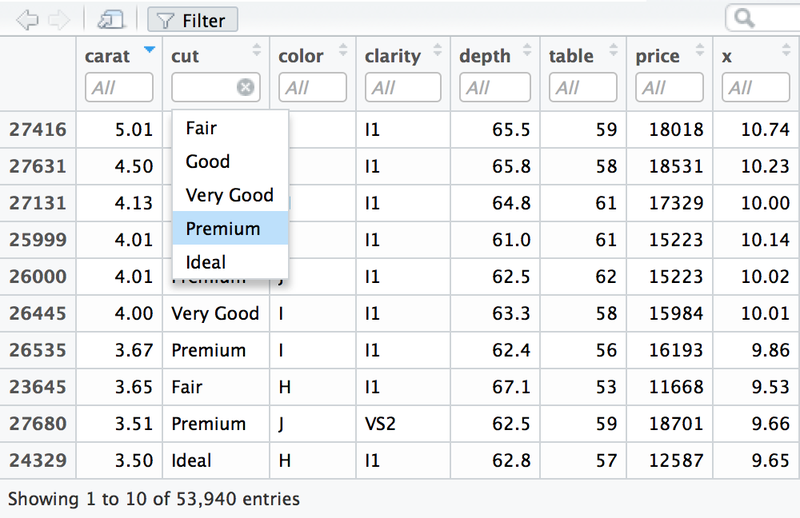 We’ve completely overhauled the data viewer with many new capabilities including live update, sorting and filtering, full text searching, and no row limit on viewed datasets. See the data viewer documentation for more details. We’ve added a new inline code diagnostics feature that highlights various issues in your R code as you edit. See the code snippets documentation for additional details. RStudio v0.99 is available for download now. We hope you enjoy the new release and as always please let us know how it’s working and what else we can do to make the product better.